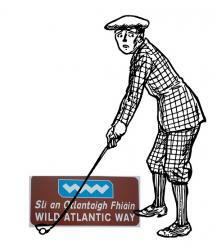 The Wild Atlantic Way Club Championship will take place on Sunday November 4th at Carne. All Clubs along the Wild Atlantic Way are eligible to compete in this 4 person Scramble. Each Club is represented by one team and this year the Captain Fergus ,Lady Captain Assumpta, President Edmund and Golfer of the Year elect Damien are representing Belmullet. On Saturday November 3rd there are Open Singles Competition for both Men and Ladies, entry fee €10. On Sunday November 4th outside of the WAW Club Championship, there is also a separate Scramble , any combination, Ladies, Gents or Mixed,tee times available from 0844 to 0932. Teams of four Entry €10 per person. The weekend will be rounded off by a gala dinner in the Talbot Hotel at 8 pm. Limited tables are available at a cost of €30 per person. Entertainment afterwards on what promises to be a great night.